Eric Bloat, of Bloat games has been an outspoken supporter of Lands of Lunacy and was an early backer. Now that the setting guide has been rolling out to all the backers Eric reveals what’s in his box. 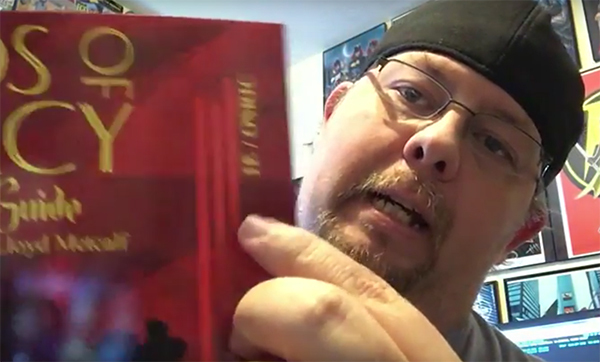 It’s worth the 3:30 minute reveal as he gives his first impressions of the book and the contents of his standard backing package. Eric knows games and keeps his thumb on the pulse of the OSR RPG world. I won’t lie when I say I was a little nervous when I saw the video pop up. I hoped we would be up to snuff with expectations. If you Missed it Ol’ Man Grognard also did a review of the Lands of Lunacy Setting and you can see that HERE. You can now order your Lands of Lunacy setting guide in the Webstore under the Lands of Lunacy section. You can order 1E & OSRIC or 5E, PDF or Print right now! Thank you for the kind words Eric, and if you would like to see the TED talk he refers to, click here. Do you have an unboxing video of Lands of Lunacy? Review? A video of your Lands of Lunacy Game? Share it with us, let us know how it went… and if your sanity survived!